Have you ever noticed that some people just “get” language learning, while others—even though they dedicate more time and effort—struggle to remember concepts and vocabulary? This language learning efficiency is multi-faceted, but one factor that influences a language learner's ability to efficiently learn is his or her use of Language Learning Strategies. Language Learning Strategies are beneficial not only for enhanced language learning, but also for increased learner independence. As educational theory moves away from a teacher-centered model, it becomes more and more important to empower language learners with the skills to operate in the new, student-centered model. Teaching these Language Learning Strategies gives students more control over their learning. Learning style and Personality: A study of Iranian EFL students showed a low, but positive correlation between Multiple Intelligences and the use of Language Learning Strategies. Compensation and Meta-cognitive strategies were the most widely used between learners with different primary Multiple Intelligences, and verbal-linguistic, visual-spatial, and logical-mathematical intelligences showed the greatest use of Language Learning Strategies. The authors also noted that “interpersonal intelligence had no significant correlation with any strategy” (p. 218; Hajhashemi, et al, 2011). From a training perspective, this shows that certain learning personalities that don't naturally take full advantage of the Language Learning Strategies will benefit more from strategy training. Culture and national origin: A study of Chinese EFL learners showed that they generally preferred direct strategies, and that their most-used strategy was compensation, while their least used strategy was social (Zhou, 2010). The previously mentioned study of Iranian students, on the other hand, showed that social strategies were preferred second only to meta-cognitive strategies, which are both indirect strategies (Hajhashemi, et al, 2011). It's clear that using Language Learning Strategies in the classroom will benefit your students, but how can it be incorporated? This article offers an interesting discussion on four different strategy training models. However, teaching the strategies is only part of the answer. Teachers need to design classroom activities and exercises in a way that allows students to practice strategy use. Assessing the students on their Language Learning Strategies use could provide a profile used to identify which strategies are already in use by the class, and which will need to be specifically taught. For example, if your students already show high use of compensation strategies, activities that incorporate this strategy could be instantly helpful to a large percentage of your class. However, they may need to be taught to use other specific Language Learning Strategies before they will be able to take advantage of the learning opportunities. 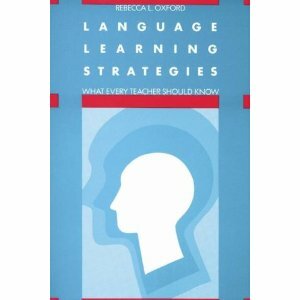 Another area to investigate when trying to help your learners with Language Learning Strategies is the text used in classroom instruction. In an analysis of Language Learning Strategies use in textbooks, researchers found that only 7 of 33 English textbooks showed extensive use of Language Learning Strategies in text instructions or in picture instructions. They note that a good text should incorporate a wide variety of strategies, because there is no “one-size-fits-all” strategy that will work for all students in a given class. Teachers need to carefully consider the texts that they use to make sure that they represent a diverse choice of strategies (the author provides an analysis instrument in the paper; LaBelle 2010). In my opinion, this analysis is important even cases where teachers have little say in curriculum or text choice, as the incorporation of outside activities becomes more necessary when the text is less efficient. In summary, effective training in Language Learning Strategies can help language learners become more efficient and more independent. Strategy choice is not a one-for-all choice, and a more diverse set of strategy incorporation in teaching will allow students greater learning opportunities. Hajhashemi, K., Ghombavani, F. & Amirkhiz, S. (2011). The Relationship between Iranian EFL High School Students’ Multiple Intelligence Scores and their Use of Learning Strategies. Accessed: http://www.ccsenet.org/journal/index.php/elt/article/view/11895. Xu, X. (2011). The Relationship between Language Learning Motivation and the Choice of Language Learning Strategies among Chinese Graduates. Accessed: http://www.ccsenet.org/journal/index.php/ijel/article/view/12067/8539. Zhou, Y. (2010). English Language Learning Strategy Use by Chinese Senior High School Students. Accessed: http://www.ccsenet.org/journal/index.php/elt/article/view/8387. I am a Mexican English teacher who strongly supports language learning strategies, I truly believe they are an amazing tool to help students help better, however, in my national context they are not widely used and I do not understand why.